“I am in love with this retreat,” says Kalyani Zavolas-Wallis, who has enrolled “every time it has been offered, except once.” She continues, “I was sad about having to miss the one, as I wanted perfect attendance. This retreat is so incredibly rejuvenating — physically, mentally, emotionally and spiritually. While it is complete and full, yet there is still enough ‘down time’ to make it feel like a true retreat. I was able to nap, and to take a bath. “I chose the Yoga Therapy Intensive as a gift to myself, to step away from the dream of my life, to be inspired by practices to help me find my way back to that place of aliveness within myself. Feeling honored to have assisted, Tirtha Hale, says, “This retreat occurred during the time when Lokananda was undergoing remodeling with new rooms being added, floors being laid, and apartments being built. Even with construction, hammering and power tools sounding off, I felt enormous Grace flowing. It’s always here! What a lovely way to experience this truth, that deep healing and Grace are always available regardless of what’s happening on the outside. This entry was posted in Ashram News on June 26, 2018 by Svaroopa Vidya Ashram. After her first meditation in “Learn to Meditate,” one student said she’s normally a very shallow breather. Indicating her upper chest, she said she always breathed “up here.” During meditation, her breaths were much deeper and full, down to her belly. This had never happened to her before. The next day she emailed that she would be practicing meditation faithfully every day. How can something so simple have so much effect? Yet it does. Arriving irritable and distant, avoiding eye contact, a client came to learn Ujjayi Pranayama in a private session with me. She announced she was already familiar with Ujjayi Pranayama. As we proceeded, she learned Swami Nirmalananda’s protocol for Ujjayi Pranayama. Of course, she had a wonderful rest in Shavasana. She yawned and yawned, obviously releasing tensions. Afterwards she reported less stress, more relaxation, no more mid-body pain. Most dramatically, she left smiling, eyes bright, inspired. I practice many forms of yoga — seva, cleaning (doing what needs to be done), study of ancient texts, chanting, asana, japa and meditation. All move me ever deeper into Self. It’s reliable! Mental cobwebs dissolve, allowing the light of capital-S Self to illuminate inner aspects of my small-s self. Regular Ujjayi Pranayama practice opens me inward to this deeper awareness. The Sanskrit word “pranayama” does not mean “breath” or “breathing practice.” A compound word, “prana” (life force) and “ayama” (to free, to liberate), it names the purpose of the practice — freeing your life force to expand fully. What joy! I’ll keep doing more yoga. This entry was posted in Ashram News on June 19, 2018 by Svaroopa Vidya Ashram. The words I use to thank our donors never seem enough. None can fully convey the deep gratitude I have for all of you. I see our charitable organization becoming a true community from your stepping up, reaching out and supporting our beloved Swamiji, her work and your fellow yogis. You are traversing this path with commitment and devotion. We have reached our fundraising goal. Your donations, especially in the last few days, have matched the Board’s generous gifts. Your $22,000 has been doubled, giving the Ashram the ability to offer you so much. Thank you for your part in making this possible. Giving is never about the amount; it is about the intent. When your pure love and generosity fuel the impulse for you to give, it moves mountains. The beauty of your investment in your Ashram is that you see and experience the tangible results for yourself and your whole community. 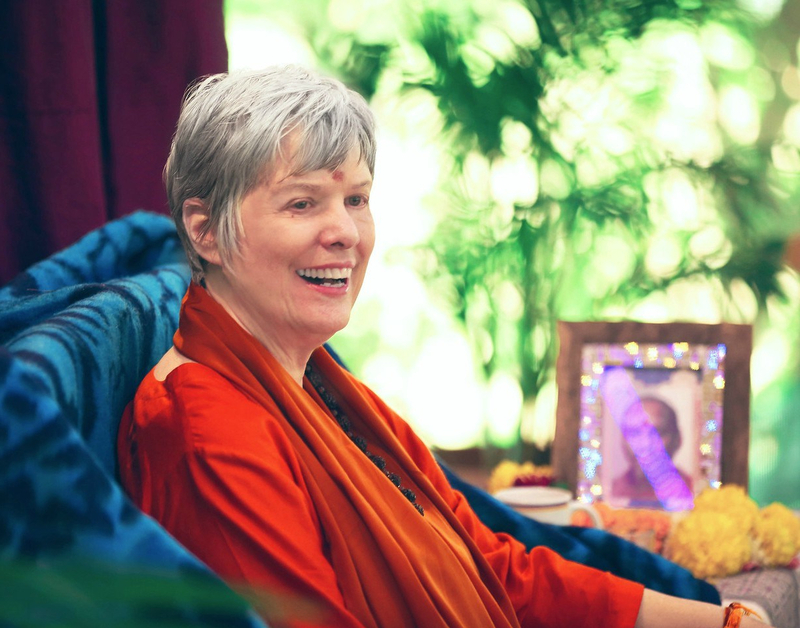 The next time you read an article or hear the opening mantra at the start of a phone call or one of Swamiji’s online audios, know that your donation helped her bring that to you and your fellow yogis. The next time you are snuggling into a cozy bed at Lokananda after a day of blissful immersion, know that your donation helped create and support your room. When you are being lovingly supported by one of the Ashram staff or Teacher Trainers, know that your donation supports them. By your gift, know that you are bringing daily support to your Guru so that she may give you your Self. So, with words that are never enough, I thank you for reaching inside to find the ability to take care of your Guru, bu investing in your Svaroopa® Vidya Ashram and supporting your community. If you would like to add a last minute year-end donation to our campaign, please click here. Your investment is the gift that keeps on giving. This entry was posted in Ashram News on June 12, 2018 by Svaroopa Vidya Ashram. Recently, I decided that doing more yoga was in order. In my Inbox, I had found the request that SVA Board Members match the community’s donations in our current fundraiser. I inferred that I would need to make a larger contribution than the donation I’d originally planned. Over the next several hours, my mind left and returned to this request many times. I just noticed that my mind continued to fluctuate without doing anything about it. At some point, the request resurfaced and my mind was still. Then decisions to make a matching contribution and the amount to contribute were effortless. I was calm, focused and tranquil before and after these decisions. I was pleasantly surprised to learn that even as financial market volatility increased a week later, my decision was unaffected. In some subtle way, my relationship to my retirement nest egg had become healthier and more stable. Wealth: Abundance & More teaches, “When you put your energy into your work and you get paid, that money is your energy in a tangible form. When you give out money, buying something or giving to a person or charity, you are giving your energy out.” My prior donations to the Ashram were given in gratitude for what I had already received. I wanted to support the programs that we offer and the staff who make them possible and to help to spread Swamiji’s teachings to more people. I saw my donations as an investment in the change I want to see in the world. I saw my donations to the Ashram as investing in benefits to others. Pre-retirement, I had often advised my tax and investment clients to invest in yourself first. I had to shift my perspective to understand that my donations to the Ashram are investments in my Self. I had not really considered that the act of giving would benefit me directly. Now I understand that my giving increases my receptivity to Grace. We Board Members together have now pledged $22,000 in matching donations. When you donate to the Ashram during this fundraiser, you double your investment in your Own Self. The return to you on this investment is priceless. Our matching donation enables us Board members to join with your offering to the One Self Being All. Challenge yourself to grow. Challenge yourself to open your heart and your wallet. Then challenge yourself to be aware of how your support, your investment, comes back to you. Click here to read more about Investing in Your Ashram. Click here to get your donation doubled. This entry was posted in Ashram News on June 5, 2018 by Svaroopa Vidya Ashram.